Looking to treat your dog or cat to something extra special this year? Look no further than the exclusive range of pet toys currently available at Petco! With the massive success of Star Wars: The Force Awakens, fans of the beloved sci-fi franchise have never been more excited. Any of those fans that happen to own pets can be even giddier about the incredible range of Star Wars-themed toys and accessories for pets. The range contains some of the most popular characters from the movies, so no matter who your favourite is, you can be sure to find something awesome for your pets! Understandably the products are only catered towards cats and dogs, but some of the offerings are awesome. You can’t go wrong with a new chew-toy to replace your dog’s old (and disgusting) one. These toys are often aimed at the owners than the pets themselves, and the biggest problem will be deciding on just one! 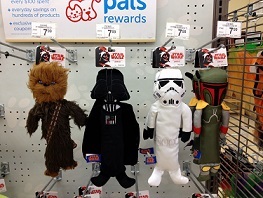 Darth Vader, Boba Fett, stormtroopers, Chewbacca, Yoda and many, many more are all available exclusively at Petco! There are a variety of toys too. You can find pull toys, plush chew toys, rope toys, bones and squeaky eggs, meaning you can find a toy perfect for your dog. You can take things a step further by dressing up your pets in some truly epic Star Wars accessories. Bandannas, headbands, hoodies, mats, collars and leashes can all be found featuring cool designs and characters from the franchises, allowing you to turn your dog into as much a fan of the films as you are! Can it get much cuter than dressing your dog up as Princess Leia? We seriously doubt it! Our feline friends needn’t feel left out either. All of your best type of cat toys can be found in this collection too, all of which have a touch of Stars Wars to them. What better way to play with your cat than to have it chasing after a Millennium Falcon on a stick? There isn’t much that is cuter than little mice toys dressed up as famous Star Wars characters that your kitty can have lots of fun with. So whether you want to dress up your pets and re-create your own hilarious Star Wars moments or want to treat them to a toy that is as much for you as it is for them then look no further than the fantastic Star Wars pet collection, only found at Petco. That’s right; you won’t find official merchandise like this anywhere else! So what are you waiting for? Hop in your X-wing and fly on down to your nearest Petco and see for yourself!